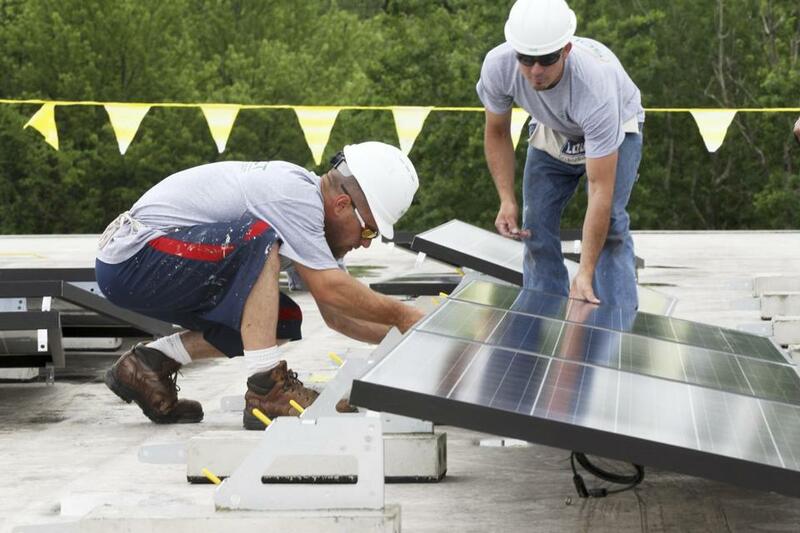 Solar energy industry is flourishing in Mass. Workers from Solect Energy Development installed solar panels on a commercial building in Northborough. 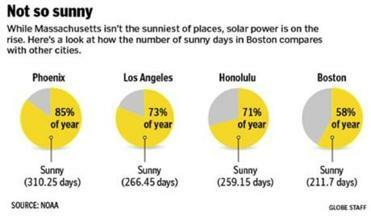 Massachusetts is no California when it comes to sun. But that isn’t stopping the solar energy industry from flourishing here. Massachusetts, better known for long, cold winters, gloomy springs, and gale-driven nor’easters, is undergoing an unlikely solar power boom, attracting solar companies from around the country that are installing systems for homeowners, businesses, and institutions. 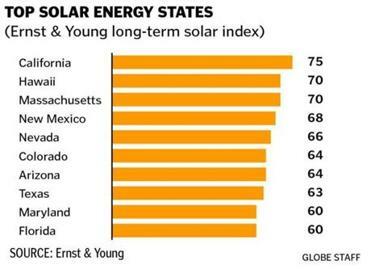 Only California has a better solar market than Massachusetts, which tied Hawaii in rankings by Ernst & Young, the Big Four accounting firm that tracks the alternative energy industry. Massachusetts was the only northern state to crack Ernst & Young’s top 10, beating Florida (the Sunshine State), Arizona (home of the Sun Devils), and New Mexico (sun symbol on the state flag). That environment starts with New England’s traditionally high energy costs that can make photovoltaic systems more competitive here. Meanwhile, the falling solar panel prices, which have plunged more than 50 percent in the past two years, have combined with solar-friendly local policies to make solar installations even more attractive to homeowners and businesses. In the past two years alone, solar energy-generating capacity in the state has more than doubled to 105 megawatts, ­according to the state Department of Energy Resources. That’s enough to power at least 15,750 homes. The number of solar installation firms in the state has also exploded, to nearly 200 last year from about 43 in 2007. In total, state energy officials estimate that more than 1,300 solar energy firms — installers, manufacturers, and others — operate in Massachusetts, employing about 14,000. SolarCity of San Mateo, ­Calif., a six-year-old installation company with 1,800 employees nationwide, entered the Massachusetts market in early 2011. The company installs solar panels at no cost to customers, then sells them power generated by the system, which SolarCity continues to own. The company is then able to take advantage of federal and state subsidies. Ed Steins, SolarCity’s regional director, said the company already services more than 800 residential and commercial buildings in Massachusetts and has tripled its local staff to 45 from 15 since September. Among SolarCity’s customers is Tom McDougall, 53, of Whitman. SolarCity installed a 6-kilowatt system on the roof of McDougall’s two-story Colonial. Since the system began operating in February, McDougall said, he has cut his electricity bills in half, paying SolarCity about $60 a month for electricity, compared with the $115 a month, on average, that he paid his utility. “I’m starting to reap the benefits of it,” McDougall said. The state has done much to promote growth in the solar sector as it chases a goal of installing 250 megawatts of solar generating capacity by 2017, enough to power at least 37,500 homes. For example, the state offers rebates averaging about $2,000 per installation through programs such as Commonwealth Solar, which is funded at about $1 million a quarter through a state energy fund. In addition, Massachusetts has created a market for solar renewable energy credits, which solar project owners can sell to power plant operators to meet state regulations aimed at reducing greenhouse gases. In the past two years alone, solar generating capacity in Mass. has more than doubled, officials say. The money from those sales helps further lower the cost of solar power. Such policies have made solar economically competitive in the state, despite less than optimal sun, said Jim Dumas, principal at Solect Inc., a Hopkinton company with 10 employees. Solect is currently installing a 475-kilowatt solar system atop a commercial building in Northborough. Municipalities are also making solar power more attractive. In Boston, the city has cut permit fees for solar installations by about 70 percent, said James W. Hunt III, the city’s chief of environmental and energy services. The permit application process can also be completed online, Hunt said, saving installers time and money. These efforts are part of an initiative to get 25 megawatts of solar installed in Boston by 2015. “We’ve been working with industry to make Boston one of the clean energy capitals of the country,” Hunt said. Richard K. Sullivan Jr., the state’s secretary of energy and environmental affairs, said the state also has benefited from the diversity of its solar industry, which includes panel makers, solar equipment manufacturers, and installation firms. “The jobs that are being created in the industry are high-end research and development jobs, but they’re also green collar jobs [for] installers, maintenance, and sales,” Sullivan said. Take PanelClaw, a nearly five-year-old North Andover company that makes the racks to which solar panels are mounted. Its employees range from warehouse operators who ship and receive products to a PhD who oversees engineering, said president Costa Nicolaou. “There are now almost a million solar panels installed with our product around the world,” Nicolaou said. Despite such success, Nicolaou acknowledged that solar energy still needs subsidies and other friendly policies to make it competitive with traditional power generators and utilities. But, he said, the sector is maturing quickly.